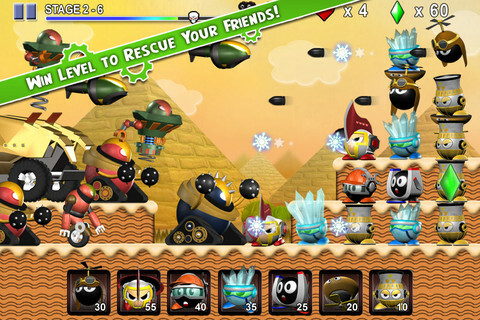 Tiny Defense is an appealing real-time tower defense game for the iPhone from Picsoft Studio, based on the Thai studio’s PC game Mini Robot Wars. As its name implies, it has a cute, cartoonish look, without being too twee or childish. In fact, Tiny Defense has a slight retro feel: think Mega Man enemies battling on a landscape from Super Mario World, and you’ve got the general picture. This app looks like pure fun from the moment you first see the title screen, and for the most part it delivers. There is a little bit of backstory, told in an artfully illustrated introduction: a heartless interstellar travel corporation has arrived on your lush, pristine planet, and wants to convert it into a tourist trap. The planet’s residents, a group of cute but fierce robots, clearly do not want this to happen. You command these robots as they defend their home from the enemy corporation’s attack machines. Tiny Defense is well-paced, with neither too steep of a learning curve nor excessive hand-holding. 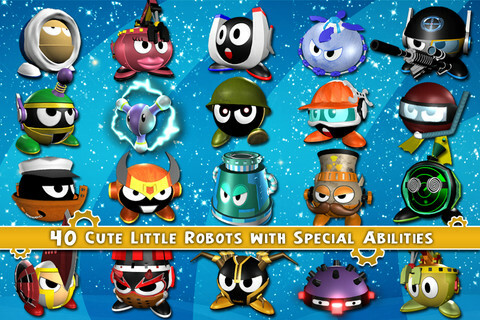 As you progress through the levels, you unlock new robots and bonuses at a steady rate. Every few levels, you encounter Mission Stages, which are effectively minigames. You may find these a fun break from the main game or an annoyance, depending on your tolerance for bonus levels. It’s a very polished game, and it’s clear that a lot of care went into the aesthetic details: the music is epic and sweeping, and the graphics and animation are nicely done. The gameplay isn’t particularly groundbreaking, however. If you’re new to tower defense games, Tiny Defense has a lot to recommend it, but if you’re a veteran of the genre, you’ve probably seen most of it before. Additionally, the English translation could have been tidier. Although the story and instructions are clear, minor grammatical errors are present throughout the text. It may seem like a superfluous detail, but the shaky grammar detracts from the game’s overall polish. If Picsoft wants to gain ground in the US market, they would do well to work on this. Overall, Tiny Defense is a great introduction into the tower defense genre, and should have widespread appeal. It’s an enjoyable, lighthearted play, and despite its flaws it’s hard to resist. AppSafari review of Tiny Defense was written by Katherine Thorne on October 13th, 2011 and categorized under Action, App Store, Games, Strategy, Tower Defense. Page viewed 5455 times, 2 so far today. Need help on using these apps? Please read the Help Page.